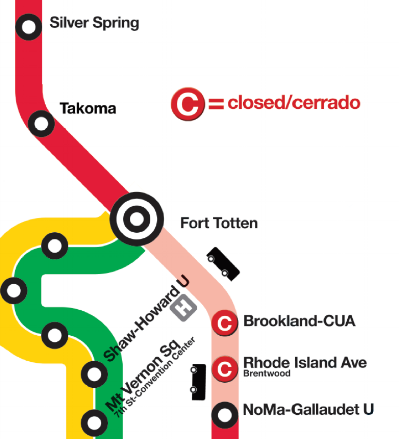 Beginning July 21, WMATA will be performing scheduled maintenance work along the Red Line, resulting in the closure of both the Brookland-CUA Metro Station and Rhode Island Ave Metro Station until September 3. 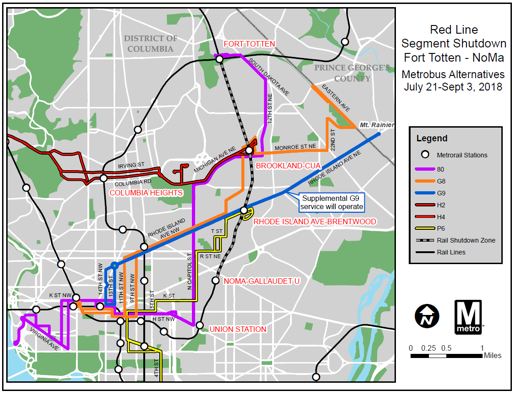 There will be no Red Line service between Fort Totten and NOMA Metro stations during this time. To assist you with these commute disruptions, goDCgo has compiled 3 great alternative routes to help you navigate your commute. Try out one of the options below and tag us with #CommuteSmarterNotHarder during the shutdown for a chance to win a free month of Capital Bikeshare! 20-minute commute from Fort Totten to NOMA, $2 per ride with Capital Bikeshare. Take the Metropolitan Branch Trail for an off-street trail (completely separated from car traffic for most of the way) stretching from Fort Totten to Union Station (see picture, right) where you can easily transfer to the Red Line. There is a Capital Bikeshare station at all four affected Metro stops, download the CaBi App to quickly purchase a $2 trip and be on your way in no time! A Capital Bikeshare corral with unlimited parking will be available at 3rd St. NE and M St. NE from 8am-1pm, on Monday - Friday from 7/23 – 8/31, so you can easily drop off your bike. Dockless bikeshare or a scooter are other great alternatives for commuting. Commute times will vary depending on traffic but the shuttles are free. Free Shuttles will replace service between Fort Totten, Brookland, Rhode Island Ave, and NoMa-Gallaudet U stations. There will be additional express shuttles from Brookland and Rhode Island Ave to Metro Center, Gallery Place, and Union Station neighborhoods. The MetroExtra G9 usually operates only during rush hour, but during the shutdown will run at all times Metrorail is open. This route connects to Shaw-Howard & McPherson Square Metro stations. It will operate in a temporary dedicated bus lane on Rhode Island Avenue NE to allow buses to avoid congestion. P6 originates at the Rhode Island Avenue Metro Station, with connections to numerous downtown Metrorail stations. 80 stops at numerous Metrorail stations, including Brookland. Check out the map below for additional bus route options and this map for the free express shuttles. MARC train, 30-minute commute and $5 one-way. Green and Yellow lines will be operating additional trains to accommodate riders that transfer between Fort Totten and Gallery Place to avoid the closed stations. The MARC Brunswick Line has a stop in Rockville Silver Spring before reaching Union Station where a connection can be made to Red Line. The MARC Brunswick Line operates on weekdays only. If you have additional questions, please tweet us @godcgo or email info@godcgo.com. WMATA has additional info here.